Length 17 ft. 6 in., beam 6 ft., weight about 250 lbs. A traditional open dory with a flat bottom and small transom designed to be rowed by a crew of four with cox and one or two passengers. Similar to the type used for fishing and which was rowed across the Atlantic. Drawings include transom for outboard motor. Very simple construction, with no awkward curves. Built upside down on frames. 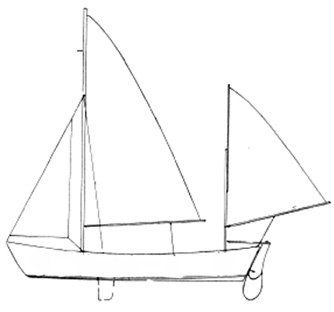 An additional drawing showing how to add a centerboard and convert the dory to a ketch rig is included also. The main mast and boom, with the main sail and jib are the same as for the Bermudian rigged Wensum. The mizzen sail is the same as for a Gremlin dinghy, but the spars are different.